Pic 1 - The Network Connections menu in the Panel. No wireless connection. Searching for the nearest LAN (local area network) cable i can get my hands on, my brother borrowed me his USB wireless adapter instead but the device was not detected by my laptop. So i had to borrow my brother's LAN cable. The cable was detected upon being plugged-in. The only switches on this laptop, a Lenovo IdeaPad Z470, are two; one for graphic acceleration and one for network (bluetooth and wireless). The network switch on this laptop (and probably on other laptops as well) controls both the bluetooth and wireless connection. In other words, flick this network switch OFF, you switch off both the bluetooth and wireless connection. 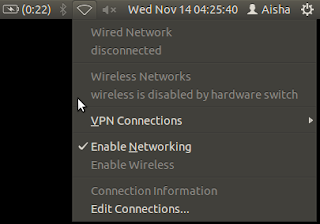 But somehow, when the network switch is ON, only the bluetooth has connection but not the wireless. In the BIOS (Basic Input/Output System) I even tried disabling something (forgot what it was :D), reboot, then enabled what i disabled, reboot and gave the wireless a try -- didn't work. This solution is for those who have Ubuntu setup to dual boot with Windows. Yes, Microsoft Windows! Could this wireless problem be something faced by those who have dual boot? 1. Reboot the device to startup in Windows. 2. Flick the the physical (hardware) network switch ON. See Pic 2. If it's already ON, switch it OFF (see Pic 3) then ON again. Pic 2 - Refer to Step 2. The network switch turned ON. Pic 3 - Refer to Step 2. The network switch turned OFF. 3. Try connecting to a wireless network. --This is to make sure there is no problem your computer's network card. 4. Reboot to startup in Ubuntu. 5. Check the wireless connection. It should work this time. See Pic 4. Pic 4 - Refer to Step 5. 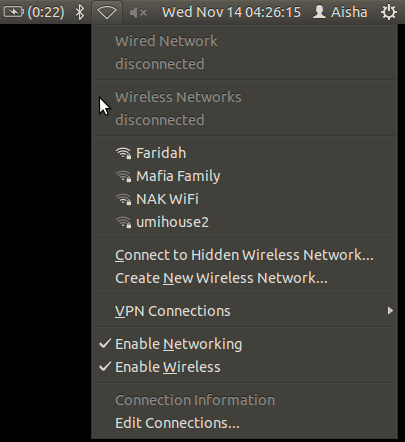 The Network Connections menu in the Panel. Welcome back, wirelesses! The only downside if i leave the network switch ON is, i have to softly (software, via the Panel) disable the bluetooth after every startup. Otherwise i can turn OFF the switch and forget about the bluetooth. If somehow you flick the network switch OFF then after the next startup you want to use the wireless: flick the switch ON then Log Out then Log In. Reboot if logging in and out does not work. It is not so good to use Windows. I hate those vendors like Lenovo... They were better when they were a part of IBM. Bastards. what if I don;t have windows? My husband had the same problem with his laptop quite some time ago, only his laptop didn't have Windows too. And he solved the problem on his own. He said he downloaded the driver for his network card. I only knew he had the same problem, but I didn't see how he solved it. It was after he had solved his problem that I asked how. And the problem hasn't appeared since, so there's no chance to test my husband's solution. So I don't know how to update this post with enough details other than saying: "try download the driver for the network card"
Why we need to use windows??.. 'sudo rfkill unblock all' will do the job.